Details from the fatal Southwest flight were unveiled Wednesday at a National Transportation Safety Board hearing, months after the plane’s dramatic emergency landing at Philadelphia International Airport. Among the most jarring scenes discussed in the hearing was one flight attendant’s account of the moments just after the plane’s left engine failed. Fernheimer reportedly grabbed one of the woman’s legs while another attendant grabbed the woman’s lower body, but it still took help from two male passengers to pull the passenger back inside the plane. At least one of the male passengers willingly reached his arm out of the window and wrapped it around the endangered passenger’s shoulder to help pull her back in. According to Fernheimer's account, when she looked out the window she saw one of the plane’s engines had been shattered and there appeared to be blood on the outside of the aircraft. The NTSB launched its investigation in April after the engine failure fatally injured the passenger in the plane’s window seat, Jennifer Riordan, the first death on a U.S. airline flight since 2009. A piece of engine cover shattered the window next to Riordan, according to investigators. Wednesday's hearing was focused on fan blade design and inspection. 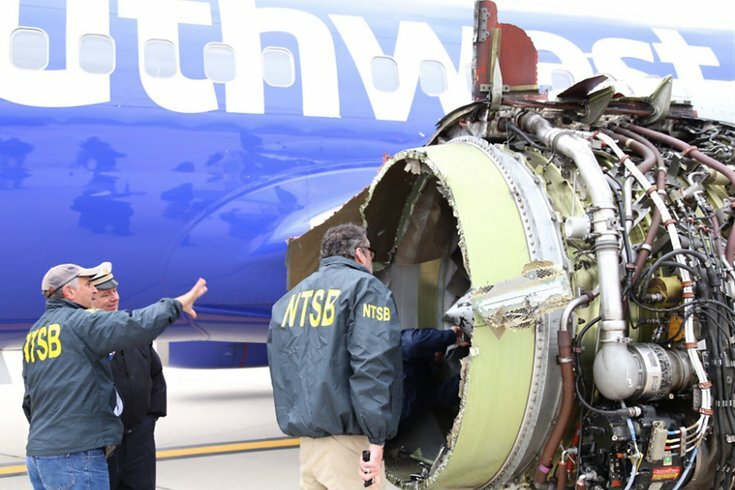 Officials from CFM International, the manufacturer of the fan blade from the Southwest flight, and the Federal Aviation Association said Wednesday they are considering whether fan blades must be replaced, even if they don’t show wear.